Last month, I went up to Vermont to cook for a gluten-free retreat hosted by fellow blogger Brittany Angell. There were quite a few grain and dairy-free diners at the retreat, so I used the opportunity to play around with some easy paleo recipes. One of everyone's favorite dishes ended up being this Cauliflower Dirty "Rice" with Andoille Sausage. The dish contains absolutely no grains, because the rice is actually made from cauliflower florets that have been ground up into fine little pieces that resemble rice or couscous. Cooked quickly on the stove, they can then be mixed with any number of herbs, seasonings, or vegetables to create a satisfying savory dish. It's a great way to enjoy a starchy-like dish if you're following a grain-free or low-carb diet. This inspiration from this particular dish came from the sausage. Whenever I'm up in Vermont, I buy a few packages of this delicious local pork sausage in a variety of flavors (generally chorizo and andouille) to use in my recipes. I wanted to feature the spicy andouille in something, and so the dirty rice was conceived! The vegetables and spicy sausage cook together in a bit of broth, then are mixed with the cauliflower to create a filling savory dish. Fun Stuff: Want to join me in Vermont next time? Click here to read about my upcoming culinary retreat this summer--and how YOU can snag a spot! 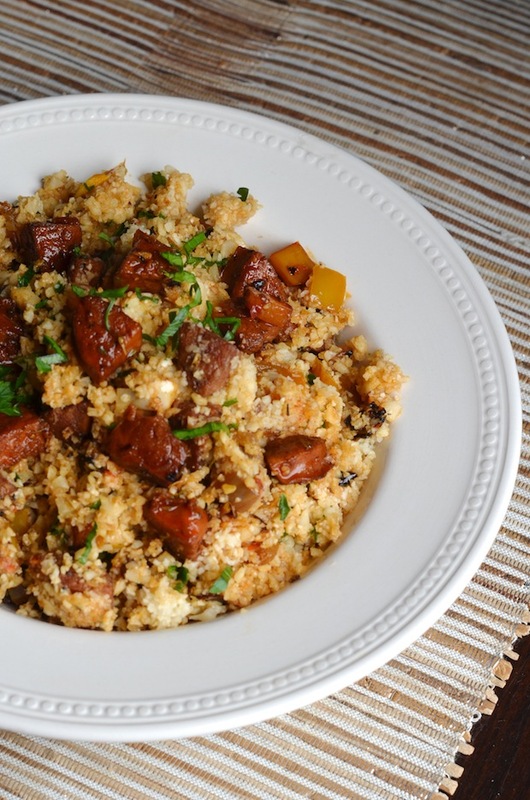 A paleo recipe for cauliflower dirty rice with andouille sausage. A great low-carb and grain-free side dish or main course. 1. 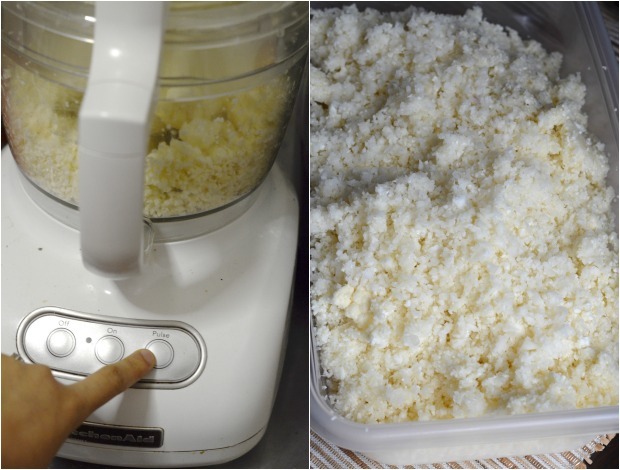 Place 1/3 of the cauliflower florets in food processor with blade attached, and pulse until florets are finely ground about the size of cous cous. Pour ground cauliflower into large bowl, and repeat with rest of cauliflower, in batches. Set aside. 2. Heat 1 tablespoon oil in a medium skillet over medium heat, and add the onion. Saute until translucent, then add the garlic, celery, and peppers. Saute for 5 minutes, then add the sausage, and continue to cook for about 10 minutes, until the vegetables are tender and the sausage is browned. 3. Stir in the spices, seasoning, and broth, and add the bay leaf. Reduce heat to low, and let simmer 10 minutes, until the liquid is reduce by 3/4. 4. While the vegetables simmer, heat the rest of the oil over high heat in a second large skillet and add the cauliflower. Cook for 5 minutes, stirring occasionally until it is cooked, but still firm (no mushy cauliflower!). 5. Transfer cooked cauliflower to a large bowl, and add the vegetable and sausage mixture (minus the bay leaf!). Mix well to coat, stir in the parsley, and season with salt and pepper, to taste.